Why should you do a retreat? There are a gazillion good reasons, right!? Doing what makes your heart sing, for one. Traveling the world, for another. Transforming lives. Sharing your experience. Hanging with friends. Living your dreams. Making good money. The list goes on and on! But the best reason of all is the magic that happens before you even board the plane. It’s all about what you become as a result of pulling it all together. In the midst of all the planning and preparing, your retreat builds a better you. Just think about it: From the moment you decide to do a retreat, you start stepping into bigger shoes. In the beginning, you have no idea how you’re going to do it. You don’t even know where to start. What will I teach? you wonder. Where will I go? How will I market this? How much will I charge? Will I make any money? And a thousand other questions — not the least of which is Will anyone come? And Who am I to be doing this? As you plan and prepare, you answer all those questions. You grow into those bigger shoes. You have to. And by the time you get on the plane, you hardly recognize yourself. You’ve become a different person — someone you never imagined you could be. If you’re a procrastinator now (and who isn’t, right? ), you won’t be for long. Why, pretty soon you’ll have big event and promotional calendars clearly marked with all the urgent, important, and even teensy-weensy little tasks you need to do each month, week, day and hour — in order for everything to come together on the big day. And guess what? You’ll be doing them, too! Why? Because your retreat is your baby, and you have to be disciplined! You used to have all the time in the world to make decisions, right? And so you made them, then revised them, ad infinitum. Not anymore. Now you’re on a schedule, and you make decisions fast! With no time to waste and your new decision-making muscle bulging, even shifting plans becomes a piece of cake. You’re a perpetual action machine now, moving purposefully through each exciting day! Websites, webinars blogs, autoresponders, email funnels, cancellation policies, strategy calls, sales pages, venues — sheesh! It’s mind-boggling even to think about all the moving parts that go into a retreat! Imagine all the tools and techniques you’re going to learn and how much business savvy you’re going to absorb. You’ll become a veritable sponge for new information. Heck, by the time you leave, you’ll be a walking retreat encyclopedia! Oops, your assistant didn’t come through! Oh, dang, that marketing idea was a dud! Uh-oh, your retreat costs just went through the roof! As you put your event together, you’re bound to run into roadblocks. What do you do? Keep going, of course! Find a way! Again and again, your retreat will teach you how to pick yourself up when you fall, how to find a way through the fog. Above all, it will teach you that taking consistent action while being flexible and resilient is how to succeed with retreats and life! If there’s anything you’re afraid of doing — like getting your website up, calling new clients, writing your bio, doing a Facebook Live, mastering technology or making sales calls — all these and scores of other things will seem like trifles after you’ve planned and promoted your retreat. If you shrink from new challenges, take heart! Your journey will teach you to feel the fear and do it anyway. So let’s shout hallelujah! You’re on your way to a gorgeous retreat and a courageous new you! Even if you’ve never blazed a retreat trail before, you’ll soon discover there are others who have, and that most of them are eager to help you on your way — to provide advice, encouragement, resources, aid, comfort and even commiseration on occasion. If you were a wallflower before, you’ll be out on the dance floor in no time, enjoying loads of great give-and-take with your new partners and friends. With retreats, you soon discover there are too many variables to be in control all the time. At some point, you just have to go with the flow. At some point, you just have to let go and trust. So you learn to dance in a special way — graciously, gracefully, flowing between planning and waiting, giving and taking, creating and evaluating. Perfection and control gradually go by the wayside, to be replaced by faith — in YOU and in life itself. Every action you take toward building your retreat, you become a little more locked in, a little more excited, a little more committed to creating a successful experience. As the actions pile up and the days tick down — as your questions are answered and your doubts and fears are quelled — you not only get closer to your goal but more solid in your stance. And before you know it, you no longer have to wonder whether this retreat’s a go; you just know! And all this is just the beginning; there’s SO much more! So wherever you are in your retreat planning, remember that retreats are all about going beyond your boundaries. 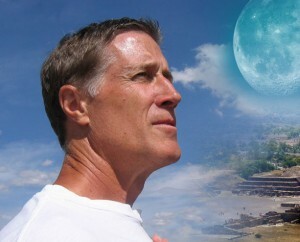 If you can, see your perceived limitations as your friends. Remember that the things you don’t know, the tasks yet to do, the problems still unsolved — all these are pushing you to become the person you’re meant to be. As you face them and solve them, you grow. And one day you realize you feel different about yourself — more spacious and happy, more present and patient, more open and receptive, more confident and comfortable in your skin. You’ve become a bigger person. You’re ready. And finally you board the plane — a confident, successful retreat leader who’s about to share your wisdom and experience with your tribe, transforming lives and making a difference in the world! Want to learn how to add retreats to your business? Then you’ll DEFINITELY want to check out our “5 Steps to Creating Your 5 Figure Retreat” free webinar training! It’s packed with top insider tips about how to add retreats to your business and make serious income while doing it! So what do we cover? How to Design a Killer Retreat & Retreat Page That SELLS! – Marketing your retreat begins with a drool-worthy sales page. Pricing Your Retreat To Meet Or EXCEED Your Projected Income – Don’t ever lose money or under-price your retreat again. The CRITICAL Strategy For Filling Your Retreats – If you do this you’ll NEVER have to cancel an retreat again. How to Make SERIOUS Income After Your Retreat is Over – You can actually net an ADDITIONAL $10-100K using this excellent tip! The 3 Legal Tips You Can’t Do Without To Be Properly Protected – You DO NOT want to leave the country without knowing this information! 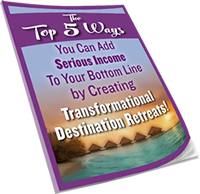 If you want to learn how to create a life-changing retreat in the next 6 months that your clients rave about, line up for, and is totally different from what everyone else is doing, you’re in the right place!